Town Square is comprised of numerous gathering areas. The West Promenade is a tree-lined pedestrian corridor along the widened walkway in front of the Old State Capitol leading from River Road to the Square. The East Promenade is a pedestrian corridor under the mature live oak trees leading to Fourth Street Plaza and Hebe Plaza. 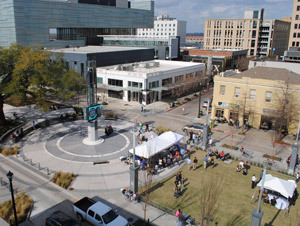 The Square is the focus of activity with the Town Lawn, Live Oak Plaza and Beacon Plaza, notable for a 35-foot multi-media tower located at the Third Street/RiverCenter axis and clad with programmable digital media panels showing upcoming Baton Rouge events, transit and weather information, local news and televised events. All spaces feature a sound system and WiFi for outdoor internet access. The Town Lawn is used for relaxation, games and to view movies and other showings projected to a large screen on the Town Lawn Stage. Many other smaller spaces create opportunities for spontaneous meetings and gatherings, as well as individual reflection, lunches and internet activities. 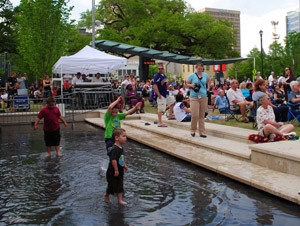 Galvez Plaza features a permanent special event stage/sculpture, the Crest, for large events in the heart of downtown, providing downtown with a first-class outdoor entertainment venue. Whether gathered together for a large parish-wide event or stopping to relax in the middle of a hectic day, citizens of Baton Rouge have an amazing place to be — North Boulevard Town Square, the Heart of Baton Rouge.